Jean Haines posted a series of recent pieces from RedefiningGod.com and then wrote her own post discussing her feelings about BRICS, Putin, Paul Craig Roberts and “Ken” from RedefiningGod. For the record, I occasionally used to post some of Ken’s articles (with my own comments and caveats) until his sexist jokes and implications got out of hand. When someone “jokes” about handcuffing someone to their bedposts and saying “Daddy’s hungry,” and then defends that degrading, dehumanizing, anti-feminine joke and others throughout a series of private emails, then they lose post-ability on my blog. The fact that I no longer post his material doesn’t mean I disagree with everything he says, though. I just think that anyone who can justify using misogyny as a calculated means of gaining followers fails to recognize the most important shifts we need to make for a healthy society — not least of which is respect rather than objectification. That said, I left the following comment on Jean’s new blog. Since students and clients frequently ask me my opinion on BRICS, Putin, RedefiningGod.com and similar topics, I’ll share my comment to Jean below. Please note: I do not give authority for my reality to an external “truth” about any of this. I’m posting my comment to minimize my need to discuss this, not to invite or initiate a lengthy debate. Please do your debating inside and amongst yourselves. My personal outcome and that of any community or individuals actively creating a new reality does not depend on any of these external factors. It depends on our own vision, our own efforts, our own skill, determination and responsibility, and our own direct relationship with the planet Herself. I post this for those already obsessing about these issues, not because I recommend people start obsessing about who’s “good” and who’s “bad.” You can make all of that irrelevant by living your life in a responsible, creative, magical way. Jean, I am not a fan of Ken’s style, particularly of his oftentimes sexist “jokes,” and I disagree with him regarding the effectiveness of magic. He lampoons the cabal’s use of magic, whereas, imho, more people ought to educate themselves on energy, symbolism, the power of ritual and the subconscious and how those work so as to direct the energies instead of following someone else’s carefully manipulated energy streams. There’s resisting manipulation, and there’s taking the reins yourself to summon tremendous fuel and energy to your own creation — two different levels of engagement. I radically disagree with him on anything Goddess related. There are gaping holes in his understanding of how energy works, and he often gets stuck in polarized thinking, despite warning people against it. That said, his research is very good, and he does offer suggestions for solutions — go local, grow your own food, get as self-reliant and local community sufficient as possible, know your neighbors, stop salivating over external Saviors, and find your own direct connection to Spirit/Divinity. These are wise suggestions. They may not appeal to everyone who wants to just sit in their living room and meditate, but his suggestions are actually quite useful. I’m a big fan of imagination, meditation and reality creation; I also know hope can be a powerful bridge to a carefully crafted alternative reality. I think he’s just warning people against the hopium that got Obama elected. For the record, I saw through Obama when no one else I knew did, except one friend. How people can’t see the things Ken shows is beyond me, but I realize most people don’t until hindsight. In addition to Ken’s suggestions for solutions, I would add to get much more in touch with the land, sea and sky — with the wisdom of Nature and with everything associated with the suppressed Feminine, something with which he seems quite uncomfortable; however, for the most part, his take on international affairs checks with my own read. I have always said and continue to assert that Putin’s a wild card. Those who claim to know his heart based on speeches or photos would be wise to step back and observe more. He’s a master martial artist; every move, every word, every gesture is calculated, but despite this, there are things he’s hiding even from himself. Those are the wild cards. I don’t even think he knows what he’s going to do. We can hope he ends up stepping away from the script, but right now, in my professional intuitive opinion, he’s right on script. Just because Edgar Cayce — who did not [always] discriminate whom and what he channeled — said Russia held great hope for humanity doesn’t make Putin the answer. Plenty of Russian defectors have given the play by play we’re currently living in, right on schedule. RT News is Russian propaganda. Controlled opposition always includes a large amount of truth or few people would swallow it at all. I’m not arguing for anyone to have a firm opinion on BRICS. I personally think it’s a bunch of the same old, same old, but used by someone savvy, even the same old, same old could provide incredible opportunities for new things. The only thing I argue for is that people take personal responsibility for their own basic needs and that they educate themselves on basic hypnosis and NLP principles so they recognize them being used. Studying actual ancient traditions instead of watered down Wicca-lite, shaman-in-a-weekend, New Age platitudes would also help make global machinations much less important. If we become wise as serpents, harmless as doves, then we can have our new world, but it will be MUCH more of our making! 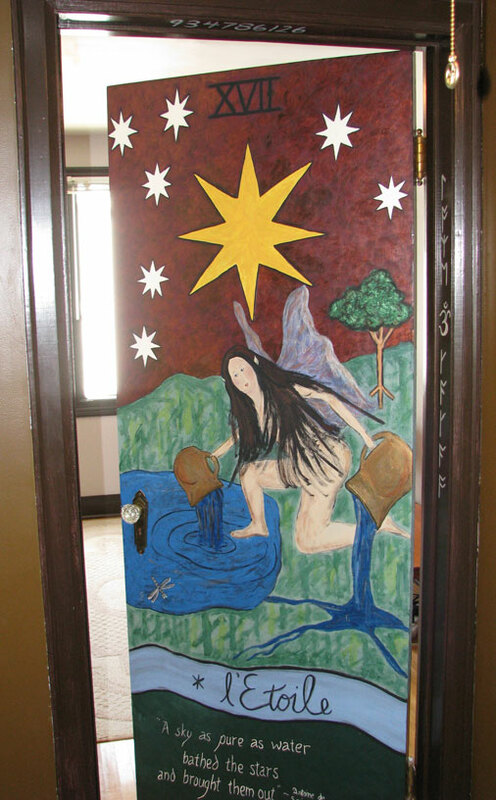 I finished Door Number 13 a couple weeks ago, but am just getting around to posting pictures here. 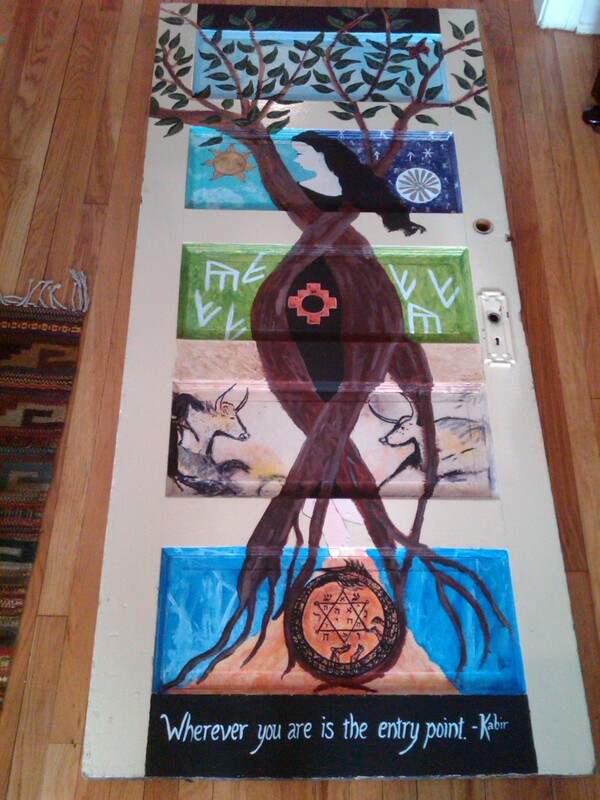 Another commissioned piece, this portal “lives” in the same home as Door Number 10. It features the Ace of Wands tarot card but quickly began combining that symbolism with the uniting of Twin Souls on this planet. Also known as Twin Flames, these highly unusual, highly spiritual relationships seem to be popping up all over the place these days. I sense that they in many ways lay the groundwork for the new, higher Earth vibe as we shift into greater love, light and freedom. 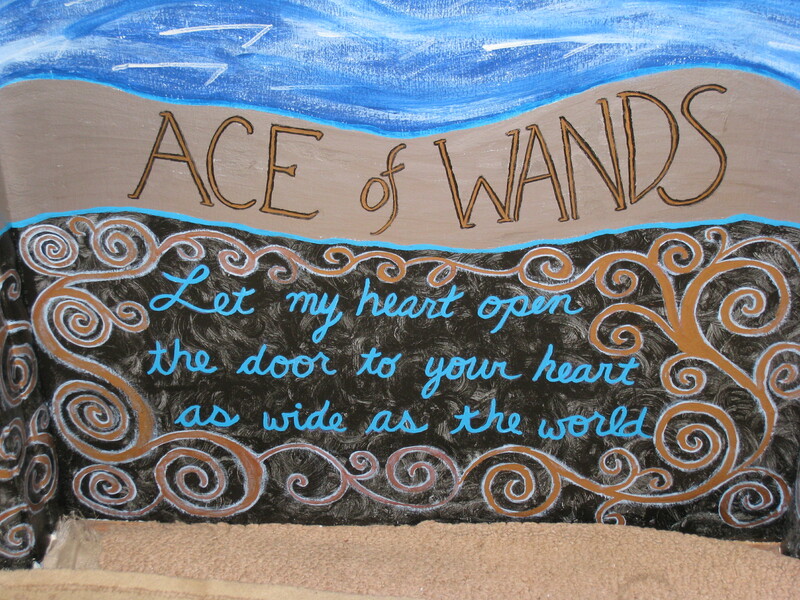 The Ace of Wands typically includes a mountain, but this door shows an actual place on Earth known as Chimney Rock, near Pagosa Springs, Colorado. This area resonates strongly with the patron, and while looking for photos we learned some interesting tidbits. For one, Chimney Rock is a dual formation, which houses an unactivated star portal between the two rocks. In keeping with this “points beyond” theme, I added a Seed of Life “crop circle” in addition to the Runic Coding used to texture Chimney Rock and the surrounding hillside. 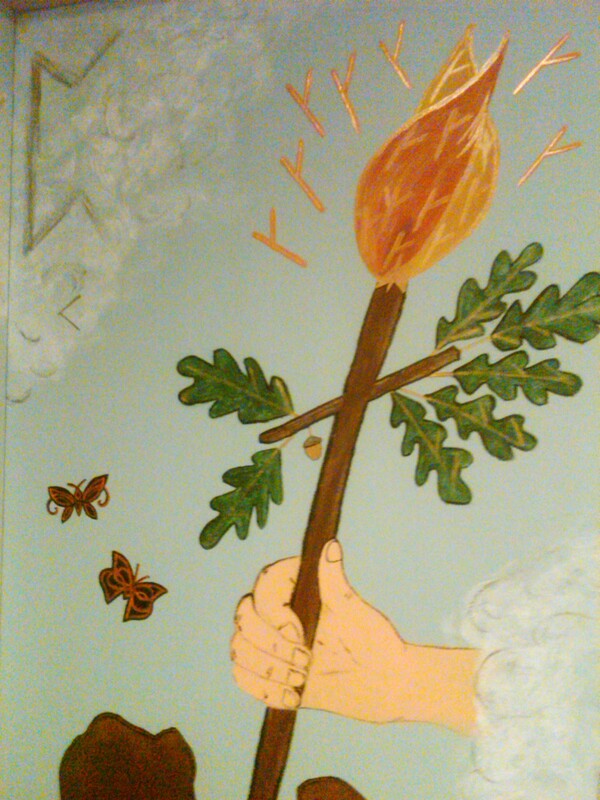 The “wand” is an oak branch turned into a torch with twin flames. It holds seven oak leaves coded for abundance, as well as an acorn, symbolizing that the mighty oak grows from and is contained within the tiny acorn. 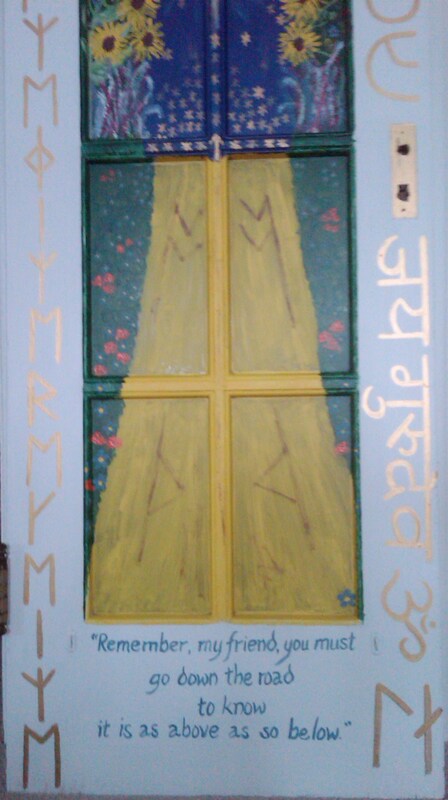 I chose to include two Celtic butterflies, as this door is meant for radical transformation. The night the patron and I decided on the cost, as well as the inclusion of butterflies, a giant monarch butterfly somehow got into my 9th floor Chicago apartment — as though confirming and endorsing the arrangment. 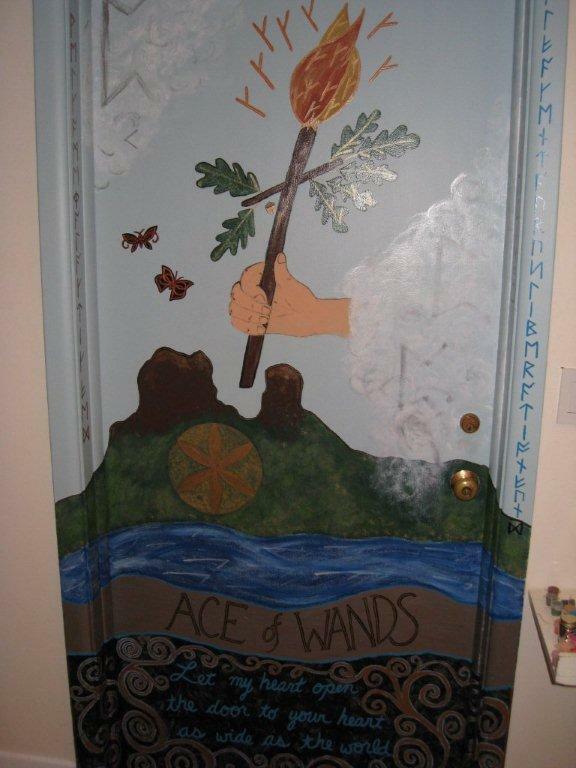 You might recognize the butterfly on the right as the same one that appears as Etain on Door Number 3, the Daphne Door. All of the Ace cards in the tarot usually feature a hand coming out of the clouds, which symbolizes “something from nothing,” “as above, so below,” and Divine intervention. I coded these clouds with Runes representing “The Unknowable,” in order to emphasize the mystical component of Twin Flame energy. 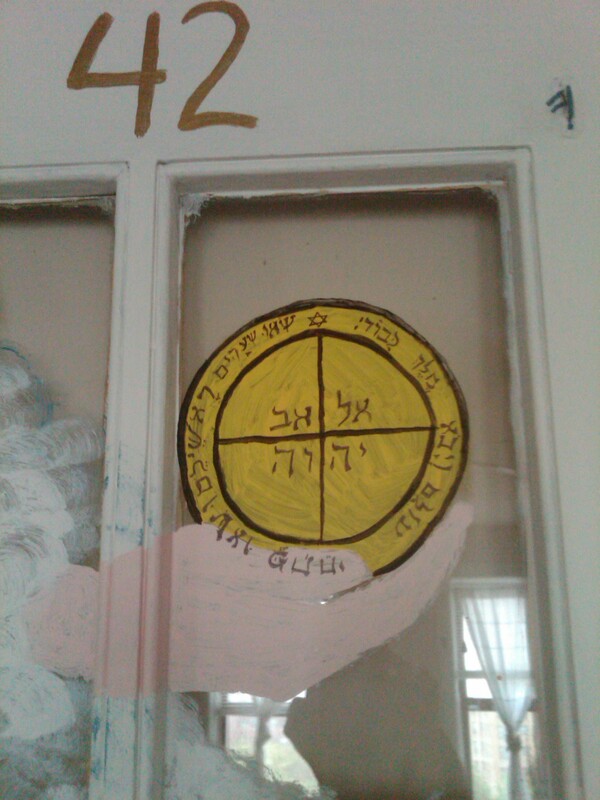 The Hebrew on the threshold spells out Elohim, which is the term used in the Genesis Creation story. “Man and woman created he them.” This actually a mistranslation as Elohim is plural and includes both masculine and feminine overtones. 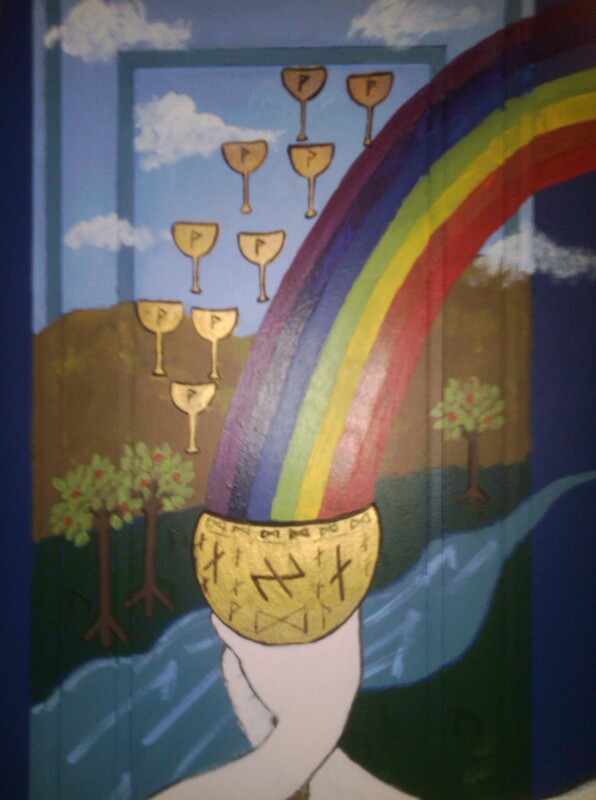 This name for the hermaphroditic god as a model for Twin Soul reunion also appears on the Lovers (Door Number 7). 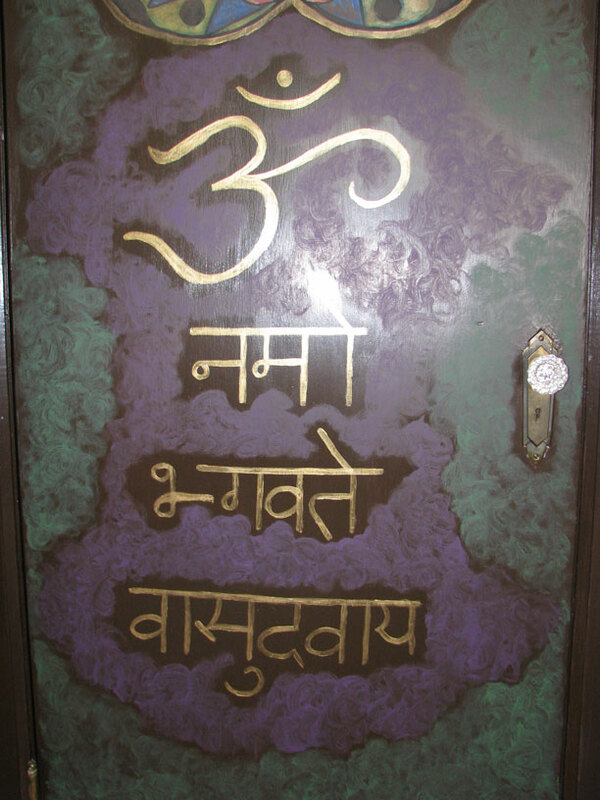 The back of “the back door” features a Third Eye and Ganesha, the bringer and removal of obstacles and thus a perfect guardian of portals. 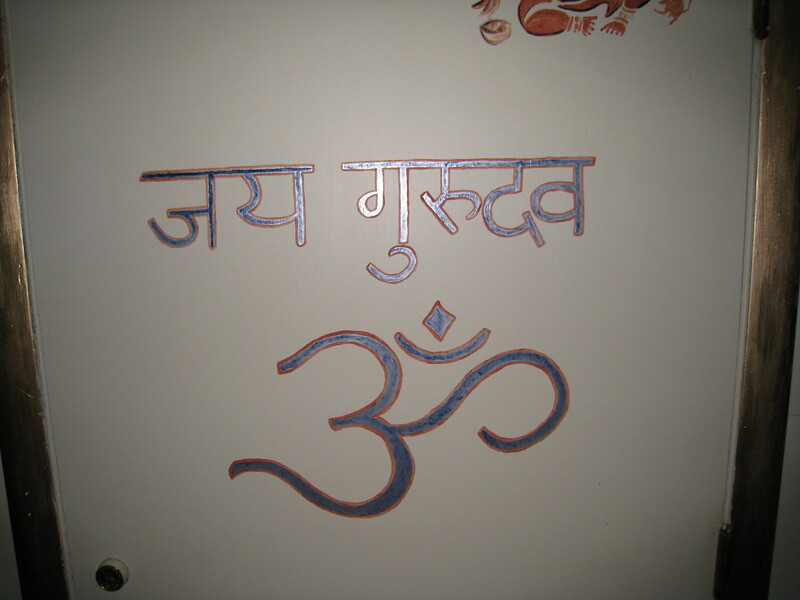 The Sanskrit is Jai Guru Deva Om from the Beatles’ Across the Universe, which is written in English below. 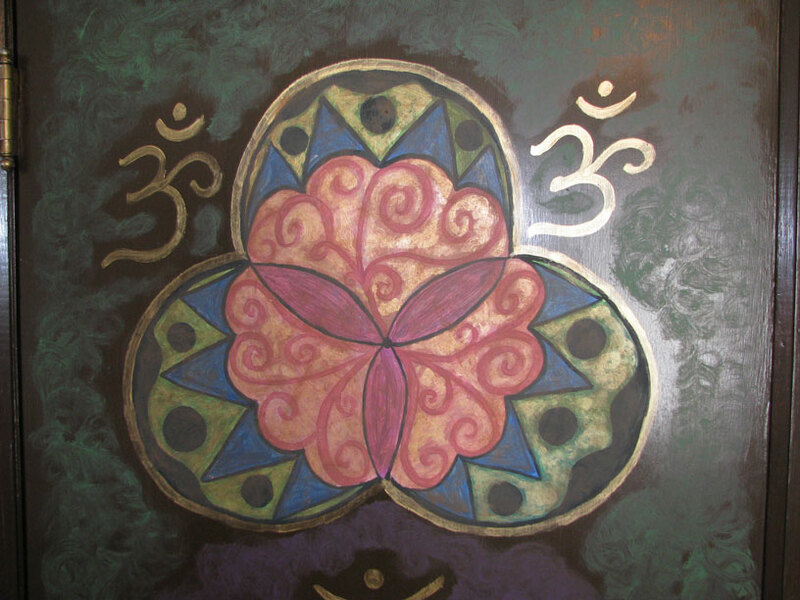 Wishing you all enhanced intuition, love and life! Also, just a quick note, that I am now making some “porta-portals,” canvas board images designed and coded as doorways, but which do not require my actually visiting people’s homes to create the intentional “doorway.” Door Number 14 will be designed as something that can sit on a desk or baseboard, a kind of mini-doorway into consciousness, which will be shipped to the patron when completed. The process remains the same, but I am curious to see how the sense of a door imprints itself within the image and coding. 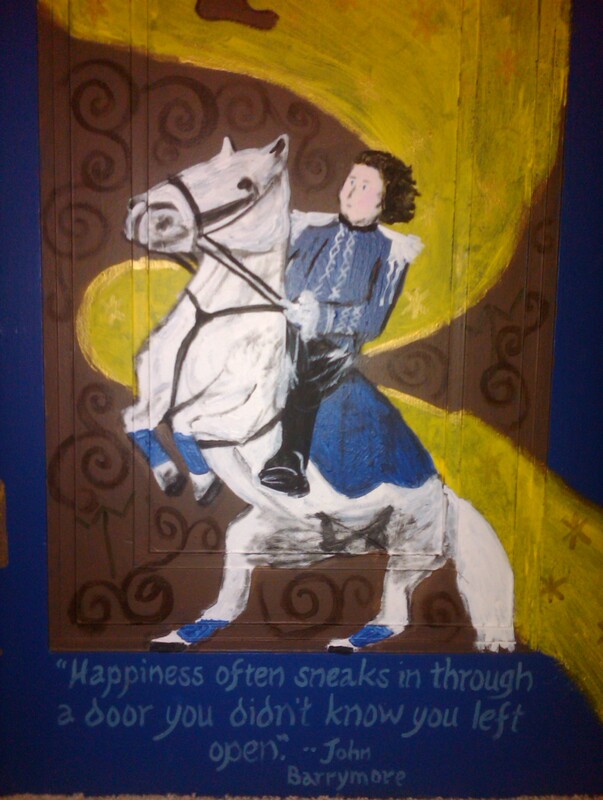 I really enjoyed painting this door! 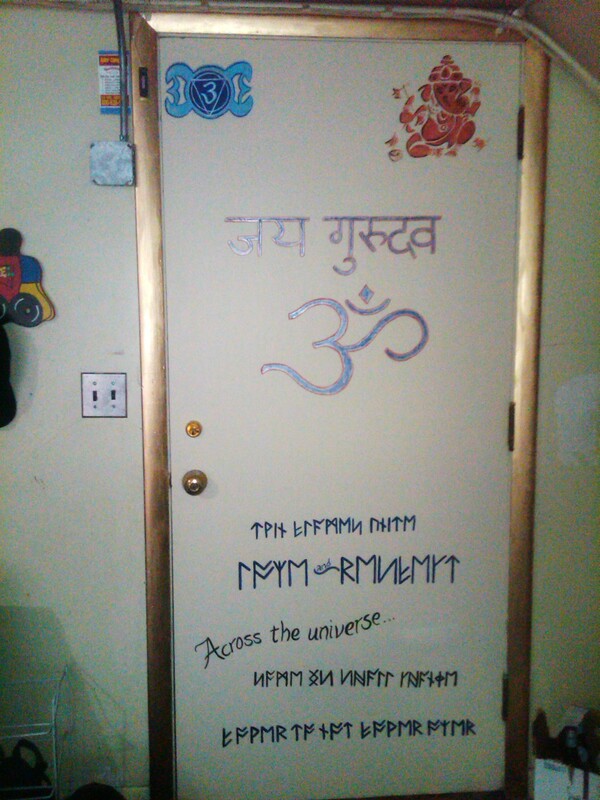 As my first commissioned door, it gave me a chance to code and design a portal to someone else’s intentions and dreams. This part of the process was as fun and rewarding as I anticipated. Once we decided on a theme — The Sun tarot card— I started asking her questions about quotes, mantras and important symbols in her life. By spending time in her home, I got a feel for her decorating style, and I also noticed that she happened to have a sun tattooed on her upper back. 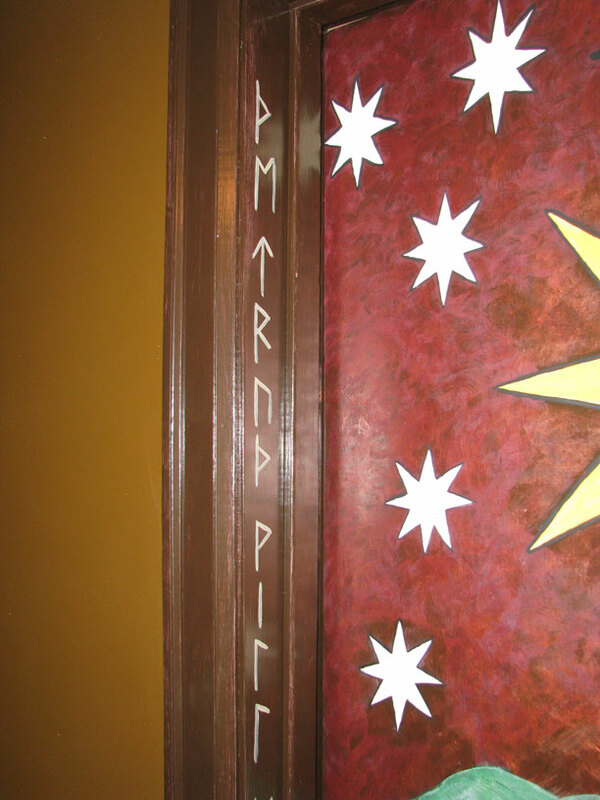 I decided to incorporate her tattoo into the door design, but at her request added some extra rays to make it look more like an alchemical sun from old texts. Overall, she wanted something bright and cheerful, but not overwhelmingly so. The door needed to fit within her surroundings. I got the idea to paint it quite vibrant and then “brown down” the colors, giving the suggestion of a faded deck of cards or a rare book. I used mountain colors because she feels a particular draw to the Pagosa Springs region of Colorado. Each of the colors suggests something naturally found in this area so special to her and her family. Door number 10 also marks my first “functional” door, in that it leads in and out of the master bedroom. 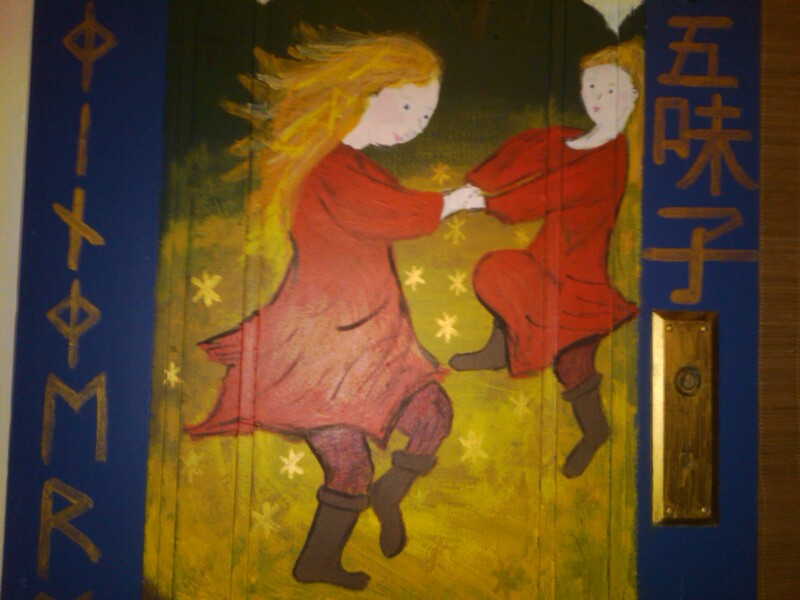 When she crosses this threshold, she actually moves through the energies of the door. We decided to work with the molding, too, creating even more of a 3D “portal” effect by using a contrasting color around the door itself. As you may remember, doors 1-9 are standalone, discarded panel doors. 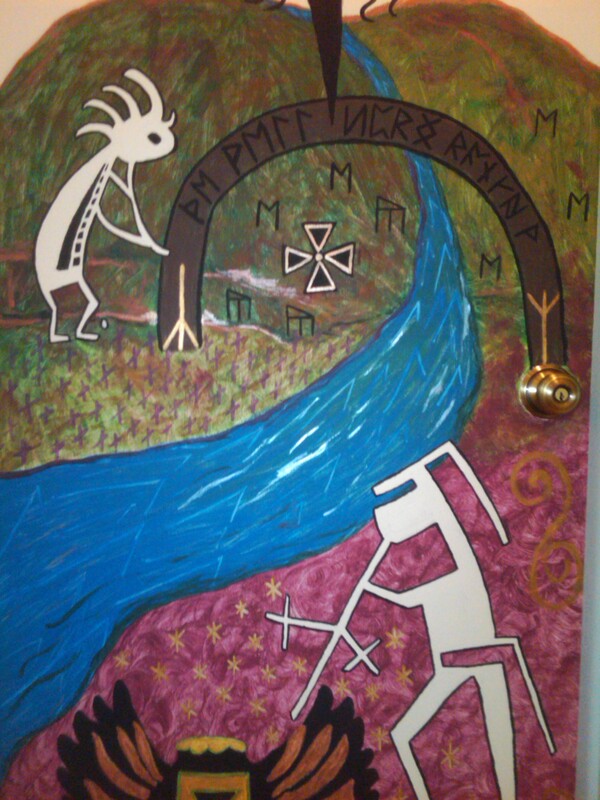 By contrast, the tenth door offered a blank canvas, with no predetermined layers or frames. I initially found this challenging, because I enjoy the inherent guidelines forced upon me by panels. As corny as it sounds, I spent about a day tuning in to this panel-less door, so that I could learn its character. I walked through the threshold, lay down in front of it, stared at it from down the hallway, until I had a real sense of what the door itself wanted to express. 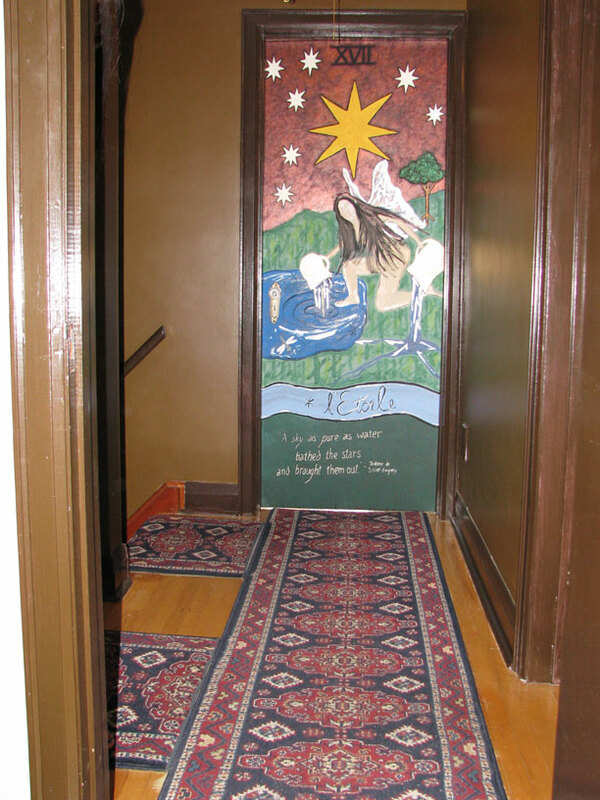 Once I felt that, I combined all of the patron’s intentions and requests with the door’s energy and the surrounding colors and a clear image came to mind. The colors divided the door instead of panels. That’s a bit of the background. I find it difficult to explain my entire process, since it mostly comes from a right-brain, intuitive and spiritually channeled, synchronous place. Music plays an important role as well. 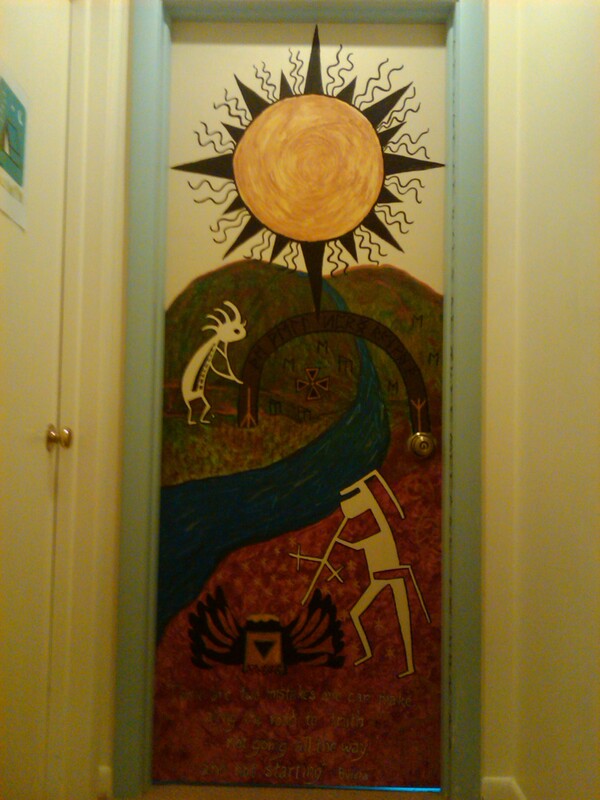 This door is most infused with two albums: U2’s The Unforgettable Fire and Krishna Das’ Heart as Wide and the World. Although I listened to other music, those albums wanted to repeat themselves most often, and I probably listened to each of them at least 6 times. I’ll show some close-up shots below, with a little more explanation. Because this is a commissioned piece, I am grateful for the opportunity to share any photos and explanation here. 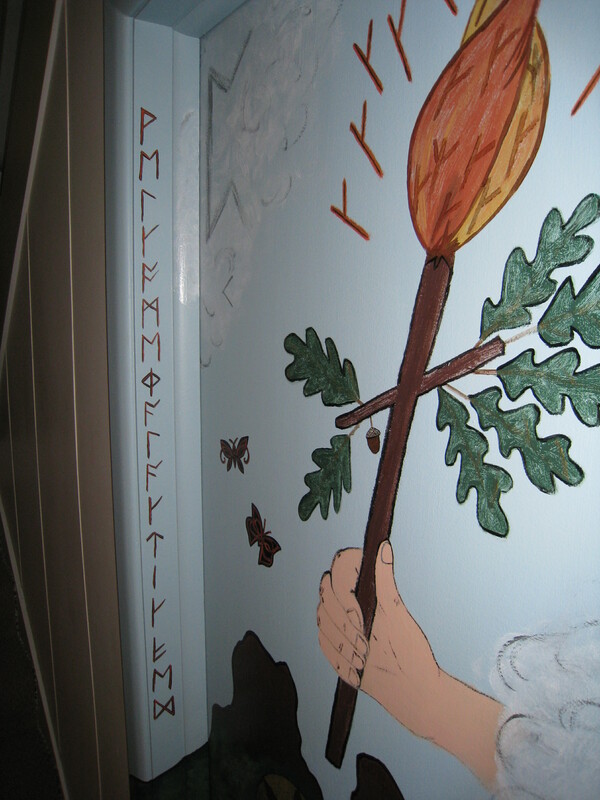 Some of the intentions are quite private, and they are encoded in Runes as texture and words. I am only describing those elements she has given me permission to share publicly. 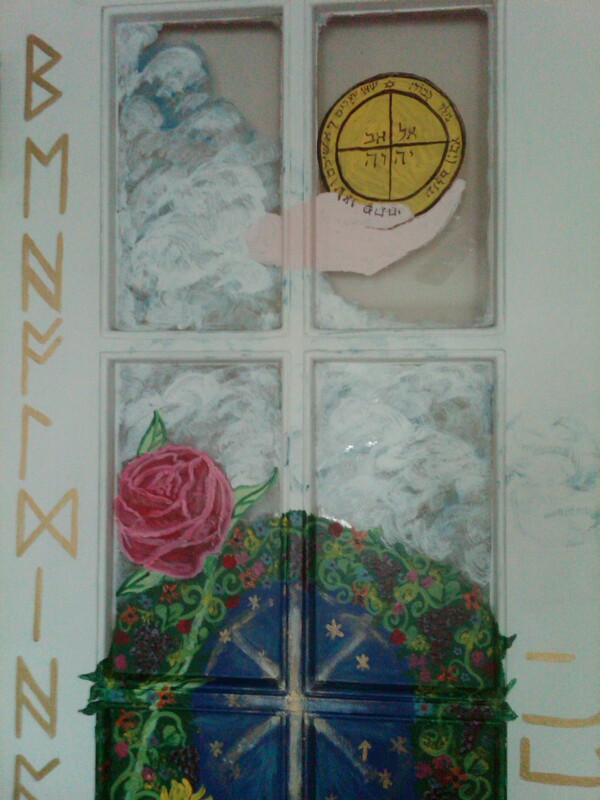 The door is actually much more complex and layered than I’m letting on here, but out of respect for her privacy and gratitude for her willingness to share, I’m only focusing on the more universal elements. 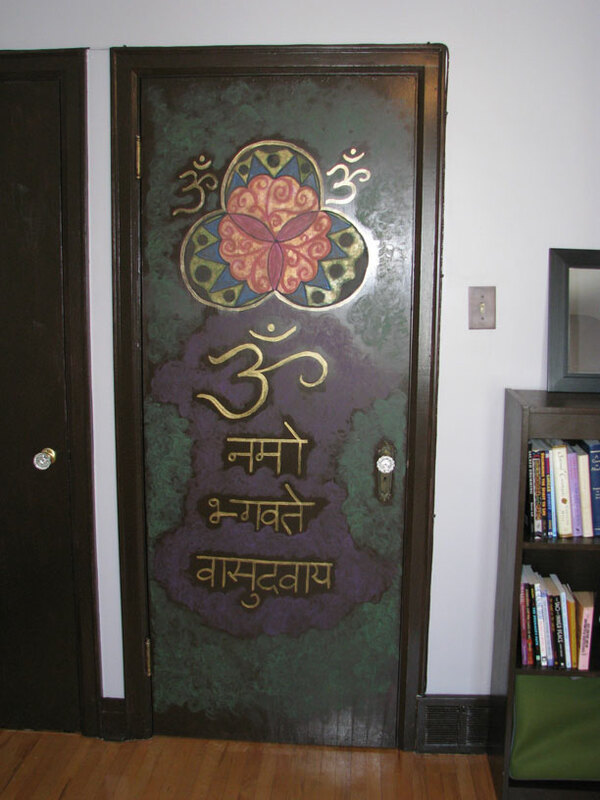 Although the doors look like artwork, the use of Runes, Sanskrit, Sacred Geometry and ancient symbols directly speaks to the subconscious mind. In this way, the doors do act as portals, because they intentionally program the subconscious mind to accept and embrace desired experiences or states of being. For the first time in my life, I feel like I am using ALL of my education and all of my brain — melding right with left, major nerdy book learning with intuitive flashes, and language with art. Many thanks to my anonymous patron for allowing me to share so much with you! The woman’s teenage sons were so cute, too. They said the squiggly lines around the sun were “male” and thus represented them being added to their mom’s tattoo. They were really excited to find themselves in the painting. 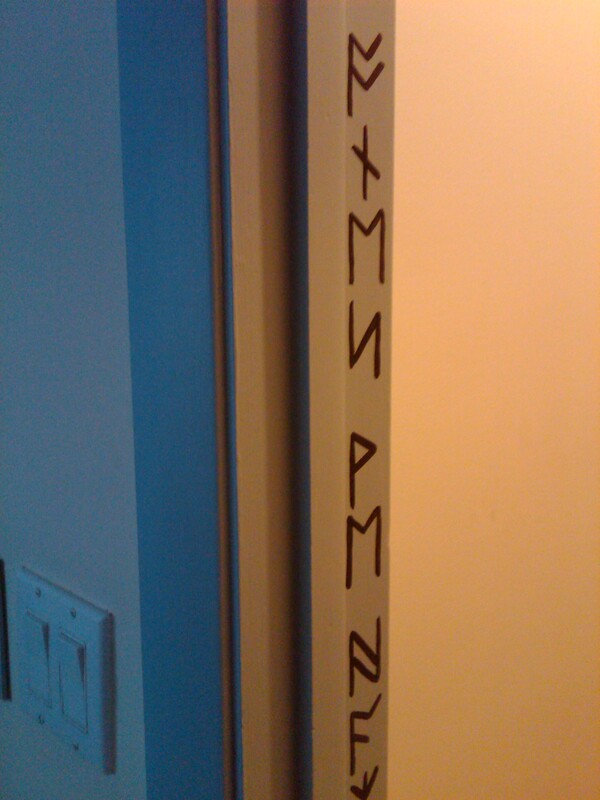 Threshold of Doorway Number 10, showing part of the Runic coding, which runs from top to bottom. 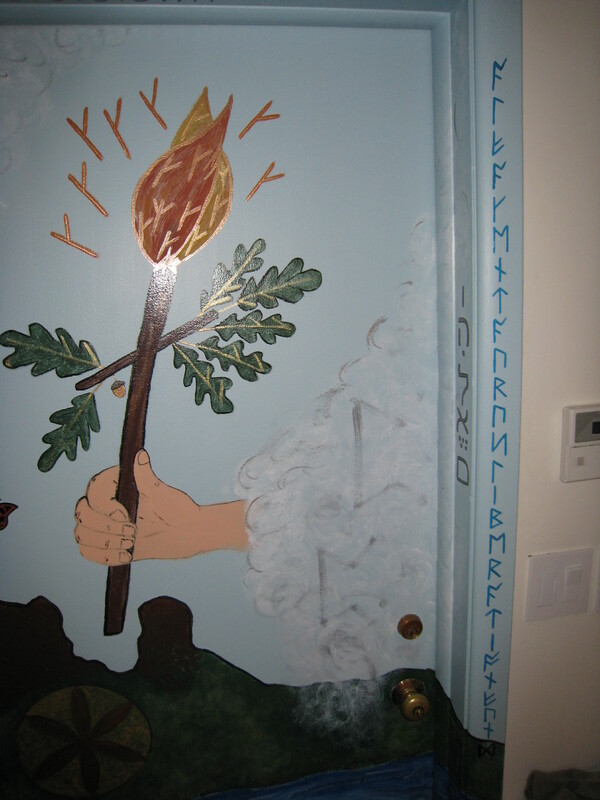 It spells out the Hopi elder saying, “We are the ones we have been waiting for.” The photo is a bit misleading as the inner room is white and the threshold is cinchilla blue. 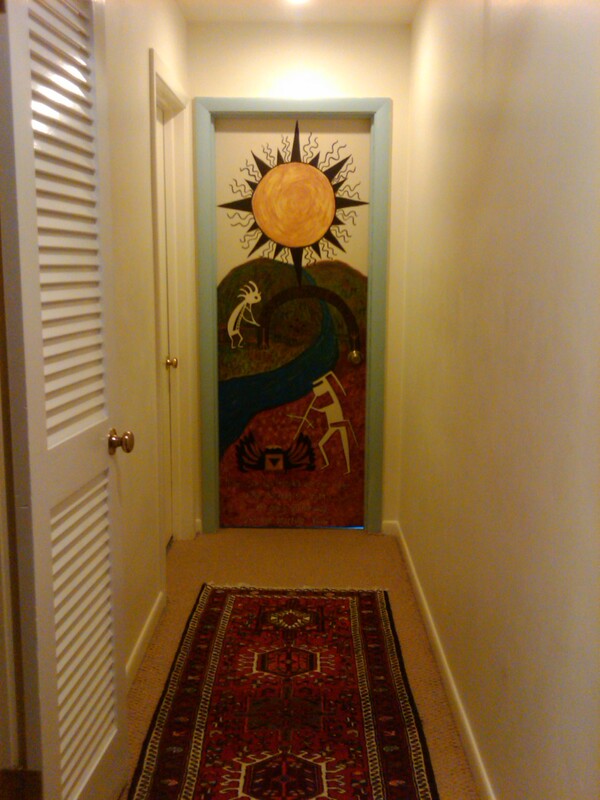 The back side of Doorway Number 10, which is in the master bedroom. 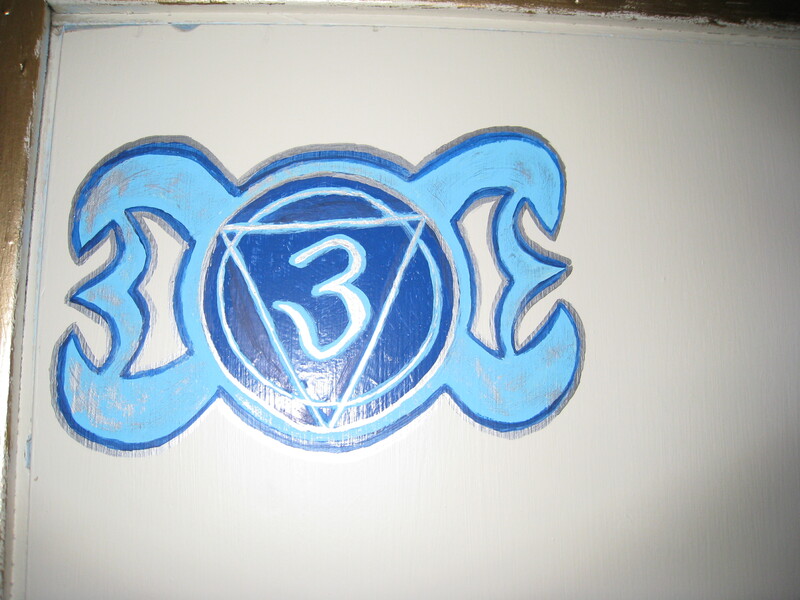 It features the Om Mani Padme Hum mantra, which the owner says on a regular basis. 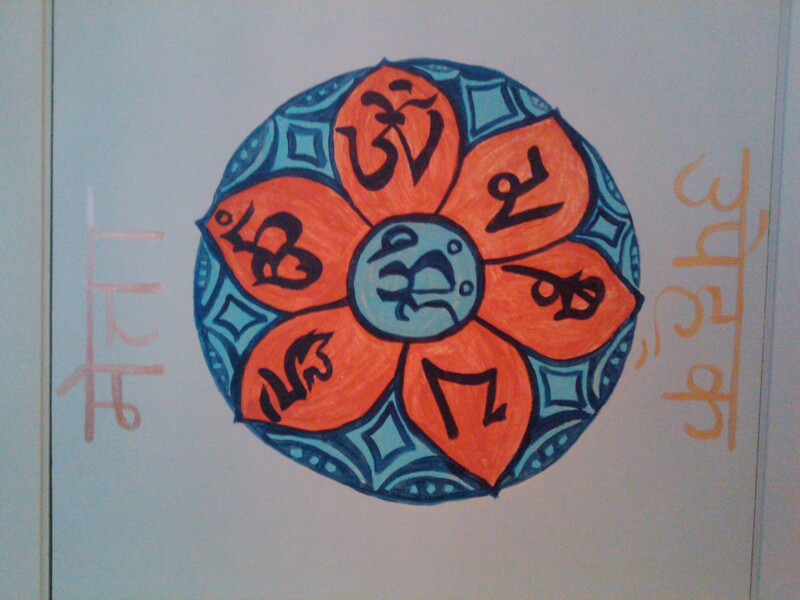 The Sanskrit on the sides (and on top and bottom not shown in this photo) lists the four aspects of this path: karuna (compassion), maitri (loving kindness), upaika (equanimity) and mudika (joy). 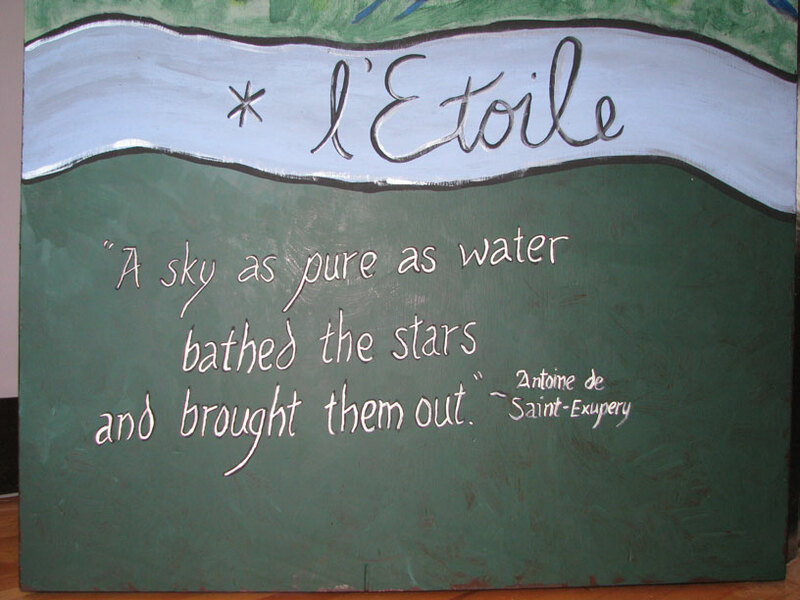 Thanks for sharing the journey with us! 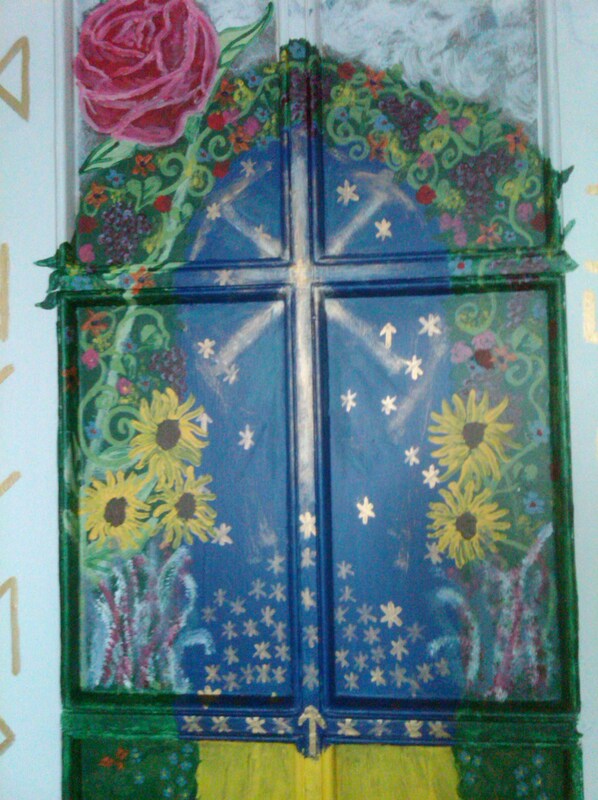 I’ve had some other tentative requests for doors, too — some of them with the possibility of painting Dutch doors. (Those are the ones that split in half and swing separately.) Door number 11 is also a blank canvas (no panels) already planned and set to start painting later next week. Each door reminds me that portals are so unique. They involve not just one element, but so many possible functions, energies, intentions, love and desires. I truly feel blessed to have stumbled upon such a powerful and unusual means of expression. 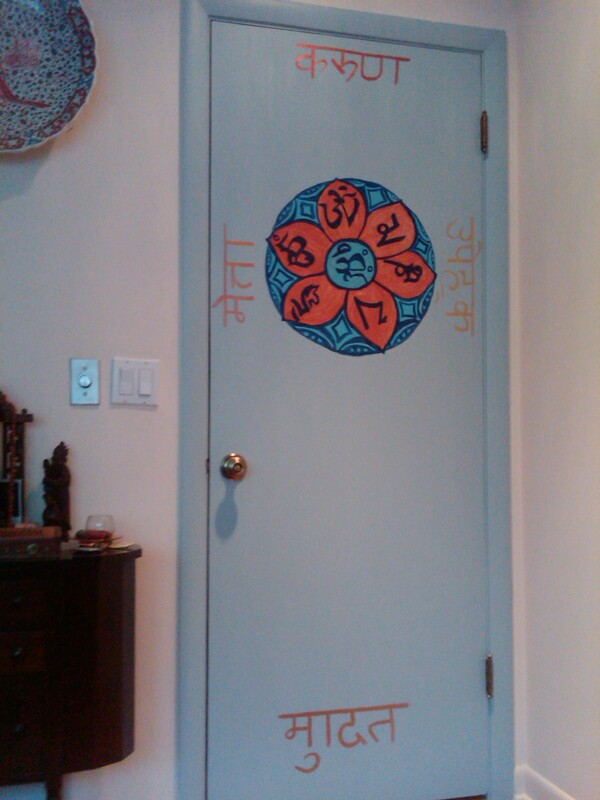 Many Blessings and if you’d like your own portal door, please contact me privately for details. Cost varies according to travel, complexity, size and style of each door. 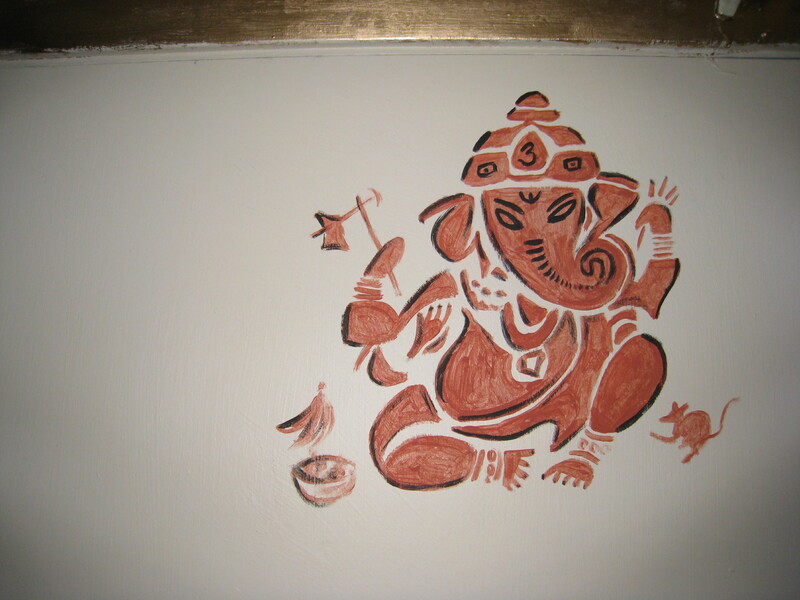 I would love to create something for you or teach you how to create your own. 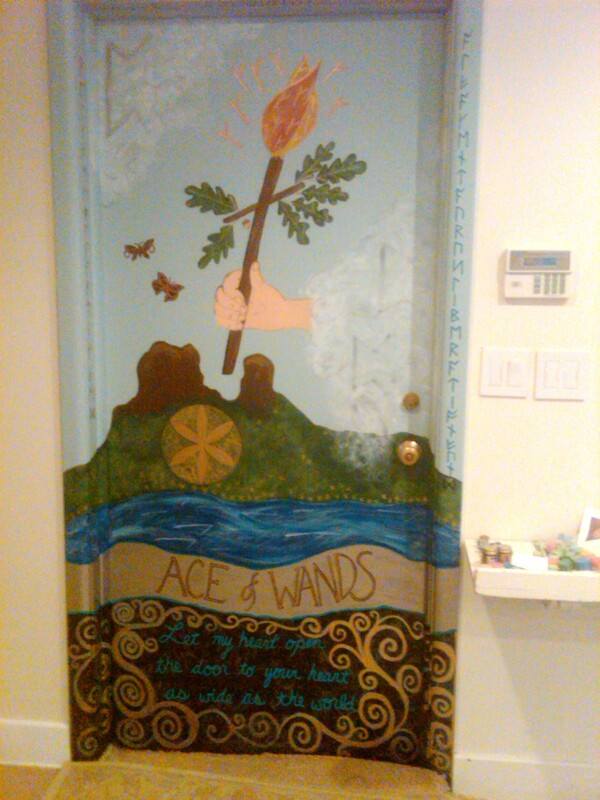 I think this might be my favorite door yet. I completed it last week but am just getting around to posting it on this #9 day (5/19/2010), which also happens to be the 12-year anniversary of my life changing brain injury. A few things about this door: it does not have a lock. I like this. 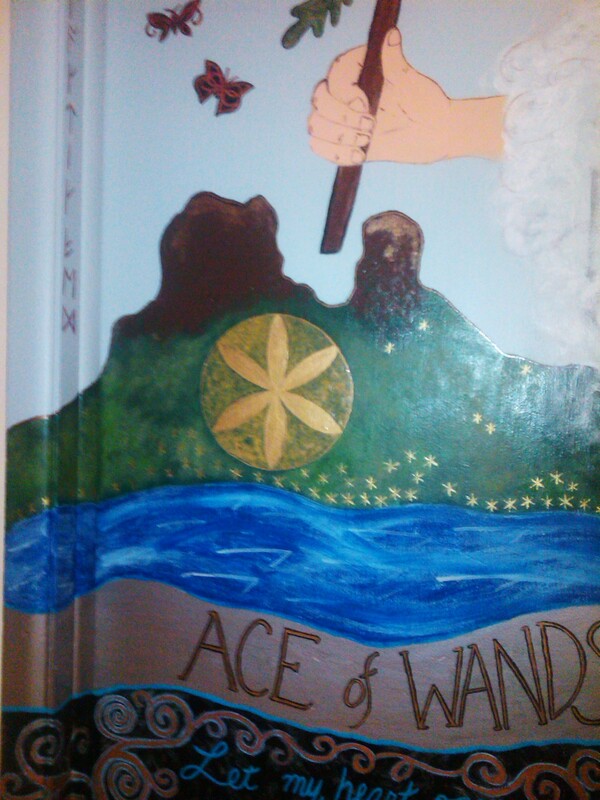 The Ace of Pentacles is all about Manifestation, so I love the fact that the door doesn’t need to be unlocked; it doesn’t even have a lock to begin with! 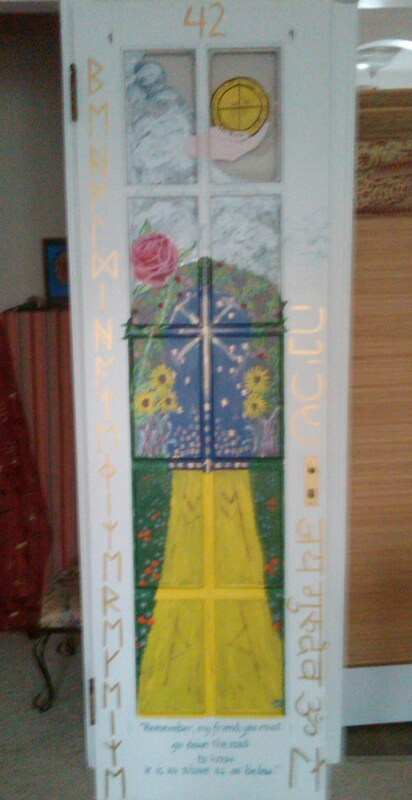 Secondly, this began as a clear, glass-paned door. 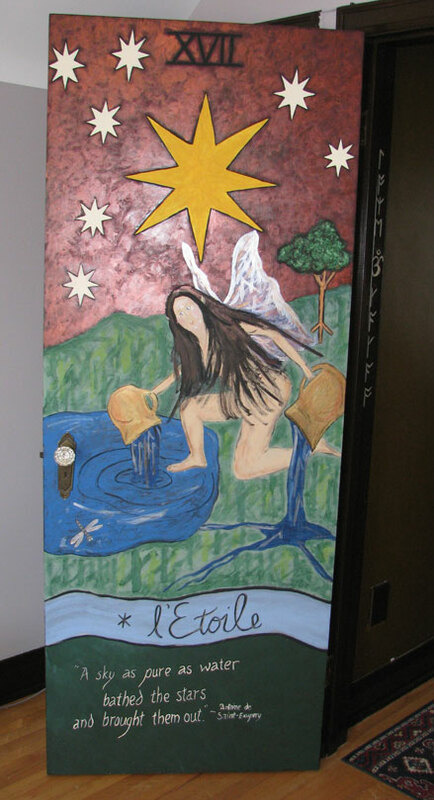 My supply of solid doors dried up, but again, I like this particular door for the Ace of Pentacles, because it brings an element of transparency to manifestation. 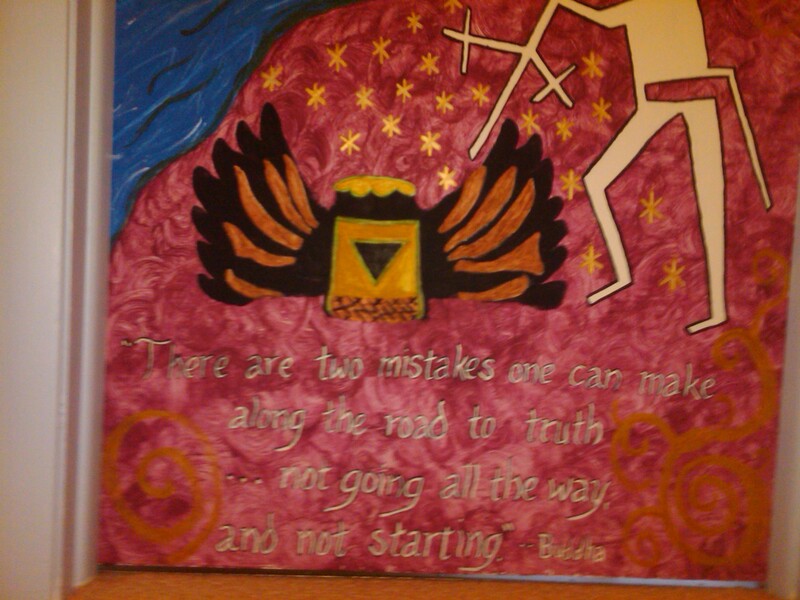 The bottom quote reads, “Remember my friend, you must go down the road to know, it is as above as so below.” Reflection, transparency, manifestation: I like it! One other note on the pentacle itself. 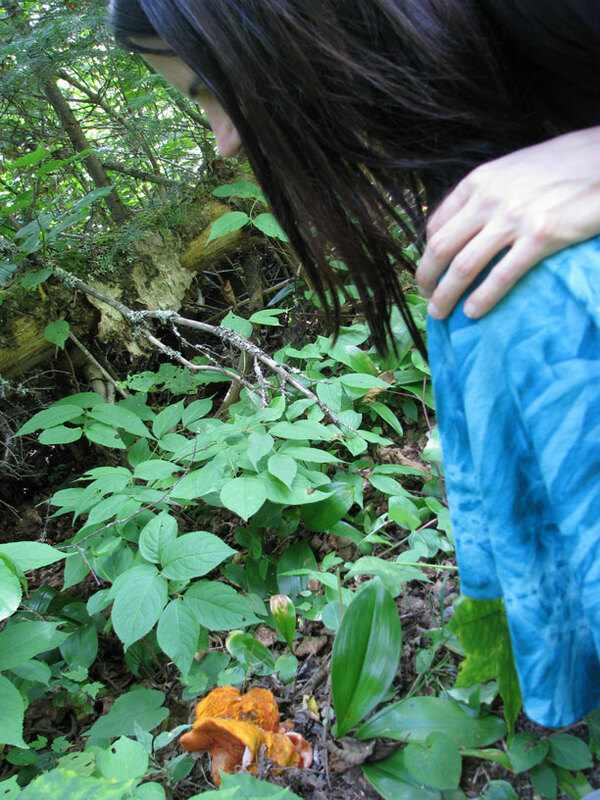 Rather than paint a plain old coin or a simple star, I went digging around for pentacles. And what did I find?? Something cool for the 9th door in a series of 9 sets of 9 (yes, I’m up to 81 as a destination number). I found more pentacles from Solomon’s Keys. The Ace of Pentacles features the 5th Pentacle of Mercury, a magical talisman designed “to open all doors.” I found this appropriate for portal work. Plus, I just like all the Hebrew. The Hebrew spells out “Shekinah.” For those of you who don’t know, Shekinah is kind of a mysterious, feminine aspect of God, often associated with the Holy Spirit. I’ve been getting a lot of intuitive insights into Pentecost lately, which is when the Holy Spirit descended onto the disciples and allowed them to perform miracles … and I like the resonance of Pentacle and Pentecost. 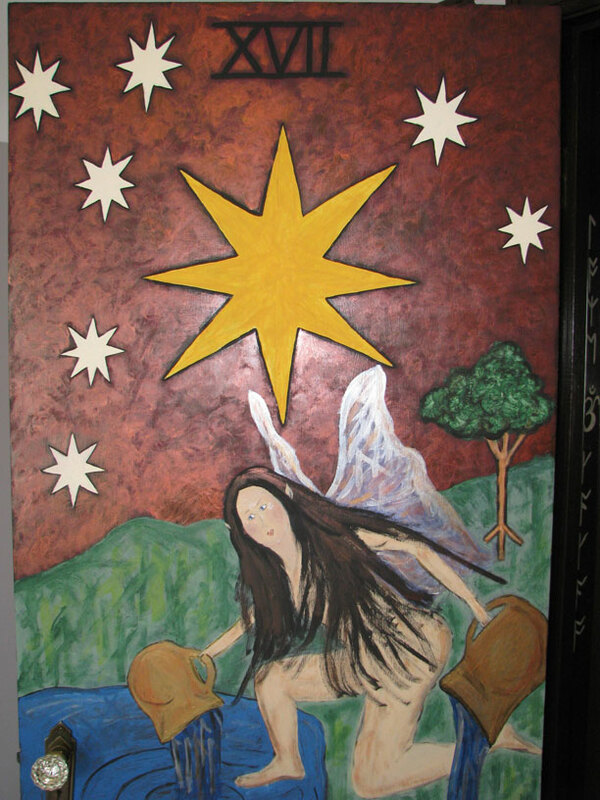 Plus, the idea of “ordinary” people performing miracles seems directly in line with the meaning of the Ace of Pentacles. 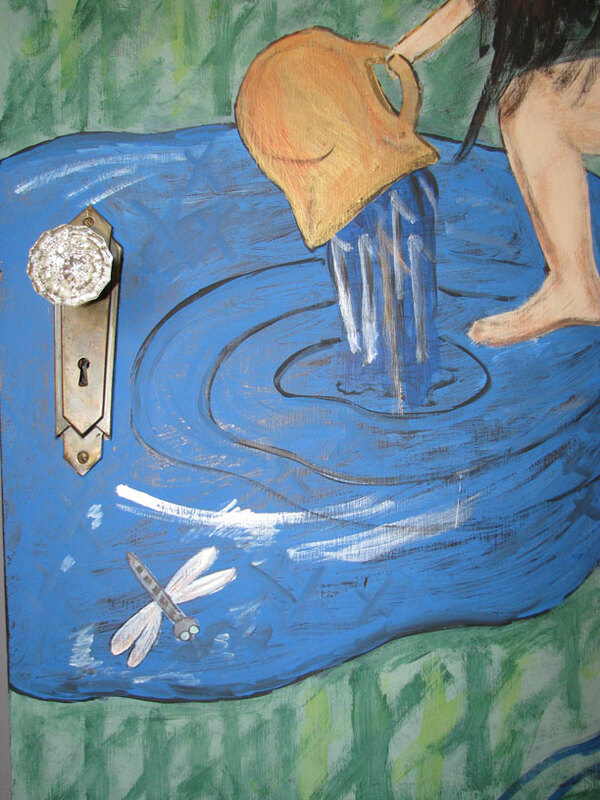 This door shows a portal within a portal, as well as a garden, representative of THE Garden … a return to an Eden-like life of beauty, love, creativity and absolute abundace. Wishing that for each of you!! 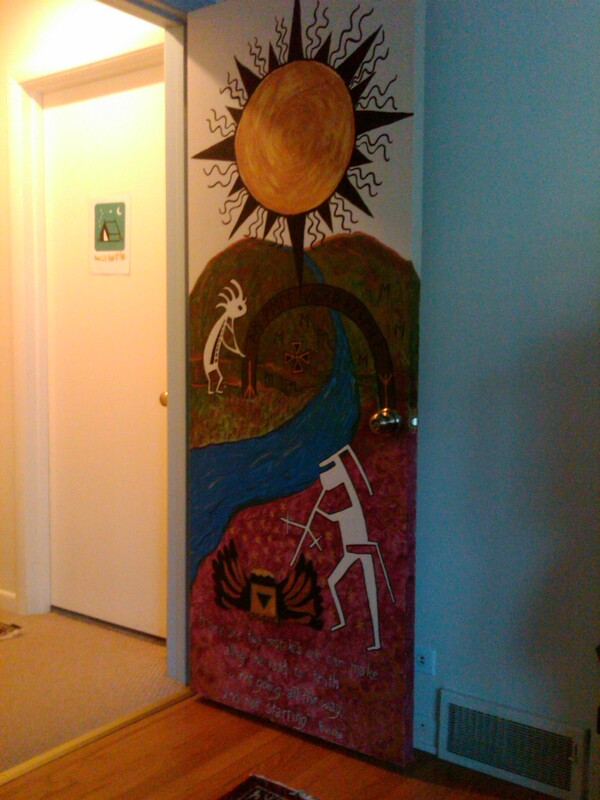 Door Number 8 began as a tall and impossibly skinny project that proved most challenging to reveal the inner vision that had begun to haunt me. I tried and tried to find a different door that would provide an easier work surface for this particular image, but it appears that the Ten of Cups wanted this door. Having completed it, I can kind of see why. There’s a lot more flow than a two or more paneled door would have allowed. The bottom quote seems appropriate: “Happiness often sneaks in through a door you didn’t realize you left open.” To learn more about the Ten of Cups, please click here. 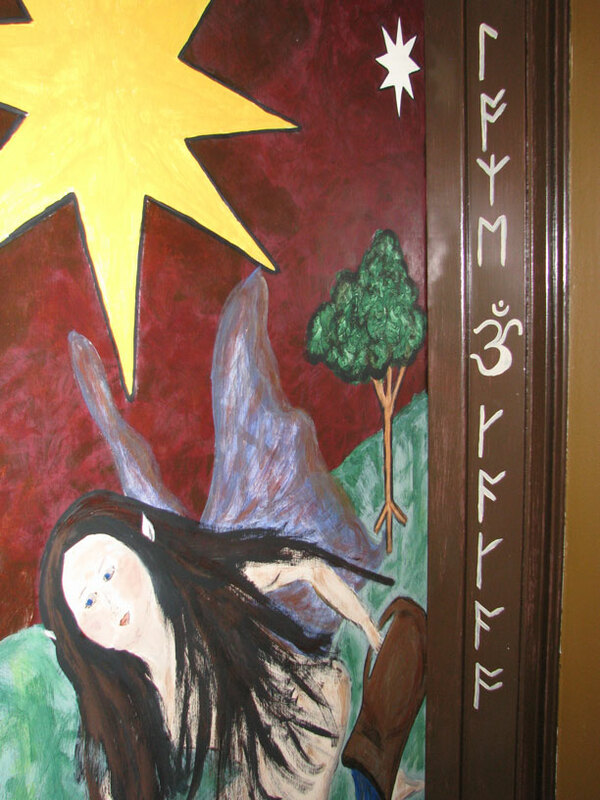 For some reason, the Runes down the front called out to be Schizandra Ginger Parker, and the Chinese on the right is Wu Wei Zi (Schizandra chinensis), both from my novel, Schizandra and the Gates of Mu. That surprised me, but I don’t argue with inspiration. 😉 Enjoy!